Made by STYLE QUEENS famous brand DANSHUZ. 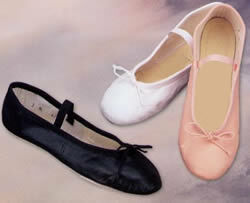 We believe these are the best ballet shoes made. Features include a pleated toe, suede ballet sole, elastic attached, Vikofome comfort innersole, stitched thru construction, boxed. 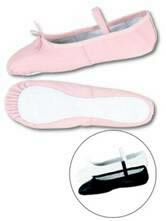 A great Ballet Shoe for the beginner or advanced dancer. Children and Toddler sizes: 6 - 8 medium width **6 and 6 1/2 available in pink and black only. CHILDREN AND LADIES ORDER YOUR REGULAR USA STREET SHOE SIZE. WE WILL ADJUST YOUR BALLET SHOE TO FIT YOU. Boys and men order 2 sizes bigger than street shoe size.